The team was very nice. The attachments for activities in the area was helpful. Best place to watch the Eclipse. We had a blast. We look forward to coming back. We booked the cabin to experience the totals solar eclipse on August 21. The view was spectacular. At the moment of totality the sky deepened to pinks and purples. The Acadia stopped, a bat flew out and Venus was visible at 2:30 in the afternoon! It was an experience we will never forget. 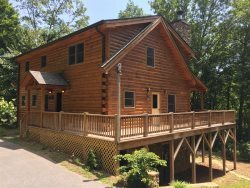 We hope to return to this beautiful cabin to make even more memories! Thanks for such a wonderful cabin and scenic vista. We will highly recommend this cabin! The cabin is absolutely beautiful. We come here every year to see our family. We spend a lot of time at the cabin and relax. Not only did we get to do that this year but we got to see the eclipse and I was able to announce my pregnancy to my whole family. I couldn't have asked for a better vacation. Between the amazing view, the fantastic cabin, the great service and amenities. And above all the total solar eclipse that we experienced right from the driveway. This was a trip of a life time for us. We really enjoyed everything about this beautiful home and the area surrounding Bryson City... So beautiful and so many things to experience. The total solar eclipse will be something we will always remember. The view was spectacular! We had several photographers that kept running out on the deck for just one more picture. The view was amazing and ever changing. The house was very clean and the kitchen was well equipped for cooking. We also used the grill outside and utilized the fire pit several times. We can't wait to come back again! Our 29th anniversary could not have been spent in a more perfect place! The peace and the view of the moon through the trees from the hot tub! The cabin is very clean! Thank you! We really enjoyed everything about this beautiful home and the surrounding Bryson City... So beautiful and so many things to experience. The total solar eclipse will be something we will always remember. Awesome Place to watch the Eclipse. No crowds, no traffic and perfect view! Thank you so much for sharing your lovely cabin with us. We were here for a 3 day weekend and to experience the solar eclipse totality. IT was the perfect view from the front deck. The pool table got quiet a work out. It is the only game left that we can beat our teenage grandchildren at. Can't wait to come back. The Big Timber Lodge is a beautiful cabin with a stunning view! We enjoyed our stay very much. We watched the solar eclipse from the deck, rode the train, took in some sights in the National Park and visited Wayah Bald Tower. We went to Asheville one day as well. It was such a memorable experience. We had a great time in the cabin. We truly enjoyed watching the humming birds visit. Sitting out by the camp fire was a great experience. The views are amazing and the cabin is more than exceptional. We will be back. The solar eclipse was amazing. We were so happy to be here for the once in a life time experience. Wow! What a spectacular view. My family and I spent 5 days and 5 nights in Bryson City to celebrate my wife's birthday as well as to view the 2017 Solar Eclipse. Staying at Southern Comfort made our vacation more than phenomenal. The pictures of the cabin are exact and accurate; by far the most spacious 2 bedroom 1.5 bath cabin that I have ever had the opportunity to experience. The cabin was well stocked, and immaculately clean upon our arrival. Before booking, be advised that the cabin is situated on a mountain, and thus a 4x4 vehicle is recommended, however not necessary. Also, you will be in the middle of the woods, so please pack insect repellent as well (we visited mid August 2017). As previously noted by other reviewers, you are not completely isolated, there are neighbors on either side of the cabin, however they are distanced far enough for the neighbors to not be an issue. Please make sure you venture out to Cherokee, and to Darnell's Farm for an even more complete Bryson City experience. Overall, a great experience that I will surely repeat. My wife, my in-laws, and my children loved the cabin! Definitely worth the booking. We will be back! We enjoyed staying at this cabin. The location is pretty convenient although tucked away up a mountain road to give you that mountains feel.